Deciding on a treatment for menopause can be difficult. With so much information on the internet and so many different opinions, it can feel impossible to know what the best option is for you. First, you need to figure out what menopausal symptoms you are suffering from and then go from there. Once you have pinpointed the exact symptoms from which you need relief, you can choose a treatment based on that information. There are many alternative treatments for menopause that do not include hormone replacement therapy (HRT), which is known to have many side effects. Instead of taking drastic measures to relieve your menopause symptoms, you can try a few simple lifestyle changes that have the potential to yield the same results as other treatments. By adding daily exercise to your routine, you are giving your body the optimal ability to fight off menopause symptoms. The healthier you are, the better equipped your body is to handle the transition into menopause. Also, a healthy diet that is filled with lots of fruits, vegetables, and water will give you the necessary vitamins to help you fight the symptoms of menopause. Certain nutrients are necessary for the proper functioning of many of your body's defenses. Black cohosh is known to help with hormone irregularities. 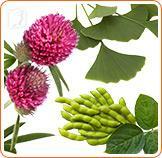 Gingko biloba improves blood flow to the brain and helps combat menopausal memory loss. Dong quai is full of phytoestrogens (plant-based estrogens) that help increase estrogen levels in the body. Ginseng contains phytoestrogens and helps boost estrogen levels in menopausal women. It can also increase stamina and energy. Red clover can help to balance hormone levels and is also prescribed as a blood thinner. Soy products can help to regulate menopausal hormones and fight hot flashes and night sweats. Macafem does not contain phytoestrogens, but it can still help battle menopause symptoms such as hot flashes, night sweats and vaginal dryness. It balances hormones by encouraging the natural production of estrogen in the body, effectively treating uncomfortable menopausal symptoms. Knowing the different ways to treat menopause is important, but it's also essential to know the symptoms of menopause. Click on the articles below to learn more about menopausal symptoms and how to treat them. When Should I Talk to My Doctor about My Menopause Symptoms? Menopause symptoms can be difficult and uncomfortable. Click on the link below to learn more about treatments. Almost 70% of women suffer from menopause symptoms. There are many different treatments available, which range in effectiveness, to treat these symptoms.